A brand what?! You’ve probably seen them on Pinterest, gorgeous displays of logos, fonts and colour palettes. But a brand board is more than just eye candy – it’s a roadmap for how to use your brand! I always include one, even for my entry level brand identity design package. Why? Because inconsistency is one of the worst things you can do for your brand. Your website, your Instagram feed, and your business cards may all look stunning – but if they look like they come from three different companies, they’re still not doing your brand any favours. You want to make sure that you come across in the same way across all points of contact with your audience, constantly building that brand recognition and trust, making people fall in love with your brand! If you’re now thinking “oh crap, I don’t have a brand board, and I need one now!” then today is your lucky-ducky-day! It juuust so happens that I’ve put together a template for a basic brand board to get you started. The PDF can be edited using Adobe Acrobat Pro to replace the placeholders with your own logo, colours and brand images, or there’s even an original InDesign file for those of you with more advanced software on hand. If you haven’t used Acrobat Pro before, here’s a little video to show you how to edit the PDF template. If you’re gonna use the Indesign template, I’ll just assume you’re badass and know your way around Indesign. Before you start, it’s a good idea to save all of your brand elements in one folder, so you can find them easily. Also, because Acrobat Pro doesn’t let you change an objects colour in an easy way, create a separate image file for each of your brand colours before you start. The brand board has sections for your main logo, secondary logo(s), colour palette, typography, icons, brand imagery, and other visual elements. Add the elements of your brand and then use it as an at-a-glance reference to make sure all your collateral stays on-brand! When you see all your brand elements together like this, there’s also a chance you’ll think “uh-oh… this doesn’t really look all that cohesive after all…” If that happens: dont panic! It’s a good thing! Because now you know about it, you can take steps to put it right. If you feel a little lost, why not start by booking a free discovery call and I’ll take a look at what we can do to pull that brand together and make it shine! 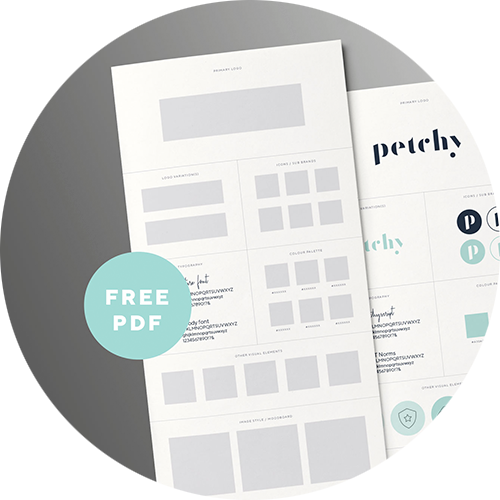 SIGN UP FOR YOUR FREE BRAND BOARD TEMPLATE! Enter your email address to get immediate access to the template – then go build an awesome brand board. I can't wait to see what you create! Yay! Enjoy putting together your very own brand board! Feel free to edit the document to suit your personal needs, but please do not redistribute it without asking. Instead, feel free to share the link with anyone you think will benefit from this template.